Resist that temptation to take shortcuts. Simple solutions require application and always keeping the big picture in focus. Complexity seems to have taken hold of the world. It's all digitization's fault, it seems, which has heralded in "control freakery" and engendered management obsession. But stand back for a moment and take a step out of your personal bubble. Complexity can be interpreted as the lack of system overview. No one can get close to the actual problem or cause, which means no solution is found. Instead, simplicity is sought to relieve the symptoms of complexity and the mantra is: Don't think about it too much – simplify the issue, and simplify it fast. But often we're not very clever in how we try to be simple. We don't strive for simplicity itself, but instead turn to experts, mathematical models, big data that we barely understand, AI, psychology and, yes, we even look to evolution and nature for examples. But we don't ruminate on the issue ourselves, which means that we get taken in by those who dazzle us with "concrete and simple solutions," often presented in hour-long presentations. Genius simplicity can only come from hard work by those who are thinking and behaving holistically. What's the magic formula? People look around to see where simple solutions have led to super success. To be sure, history does have a few examples and some simple things have sporadically succeeded in all the decades of nonsense. 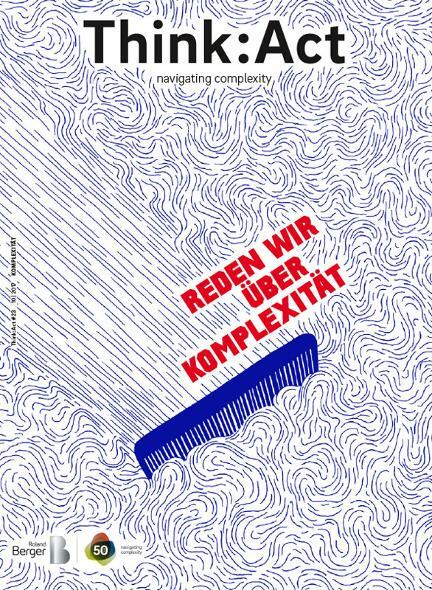 Companies like Aldi (logistics), Apple (aesthetics) or Google (customer value) are all, in their own ways models of simplicity. I would like to illustrate the drama of the naive hope for simplicity and the gullibility for pointless concepts, the underlying idea for which I found in the online article "How To Simplify Your Presentation Without Dumbing It Down" by Olivia Mitchell. 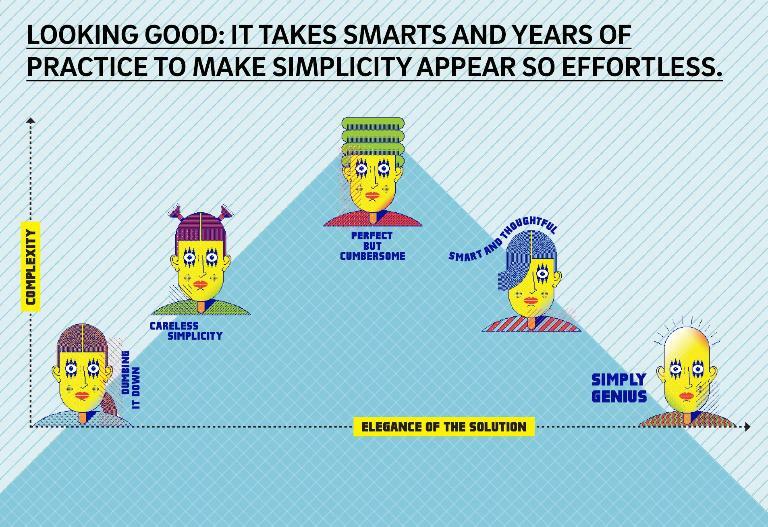 You can arrive at two types of simplicity: Either you can reduce the complex to a level of stupidity, or you can shape complexity into clear genius. Stupid simplification is more seductive than shaping simplicity into genius. It is stimulated by things like: "Let's do it fast, the boss insists." In contrast, genius simplicity can only come from hard work by those who are thinking and behaving holistically. There aren't that many people in the world who can do it. As I mentioned earlier, Aldi managed it. Steve Jobs and the founders of Google did, too. But their kind of genius can't be replicated quickly or cheaply. Even if a company did have a genius in its ranks, that person would probably end up sitting in meetings where everyone is searching feverishly for simple ways out. The people in the meeting aren't fools, but they do want to simplify the complexity of their own small environments and aren't thinking about the big picture. That's why they simplify the complex into what is, for them, the most manageable thing as it appears at that moment. That's how careless simplicity – or even stupid simplicity – emerges. For example: "We need more IT experts! OK, we have too many sales people at the moment, so let's retrain them quickly." The "better to do something than nothing" philosophy mixed with time pressure turns people into fools. Almost every manager surely knows the KISS principle: "Keep it simple, stupid." But surely the last "S" should stand for something else, like this: "Keep it simple, smarty-pants." We are often awestruck by nature's wonderful solutions, by how the brain works, the harmonious interaction of orchestral musicians, Olympic champions and the shining heroes of human history. The result appears to be either smart or genius – but never something that was created. Behind that seemingly effortless "genius," that "good design," lie years of practice and learning. Yet we don't work towards genius simplicity in the workplace, and rather fight amongst ourselves in meetings where simplicity could be developed. A mathematician and the former chief technology officerat IBM Germany, Gunter Dueck is also an author and speaker known for his unconventional management philosophy. His best-known works include the trilogy Omnisophie, Supramanie and Topothesie. What is the result? A dreadful mix of variously simple ideas that get labeled as compromises and packaged as "having the best of both worlds." I call this "swarm stupidity." Contentious meetings turn into a fight for territory about political competence and power games, personal interests and mutual resentments, and they bring with them a long and painful struggle for solutions. In the end, you work to the edge of physical collapse and, with three-day stubble on your face, announce a heroically painful compromise that everyone now has to live with. Everything that was ever said, listened to and understood about the beauty of nature, community interaction and so on has fallen victim to this swarm stupidity. It isn't possible to unite different views into genius simplicity. "Think and act" is a good plan for an individual, but "think together and act together" leads to a drama that ends in tragedy. Here's a humorous example to illustrate my point. One of my favorite cartoons shows older men in suits sitting at a conference table and the caption reads: "With mild bemusement and resignation, they implement things they know will fail." How could it be done otherwise? Know how to simplify without dumbing it down. Insist on simplifying towards smartness. But how do you do that? You don't just have to develop genius simplicity, you also have to counteract the ill effects of swarm stupidity. That can prove nearly impossible in large, stable organizations where the management is allergic to ideas, innovation or customer complaints. And then there are people with competing views clawing at the table who each have the sacred processes of their various departments and their vested interests to protect. Gathering experience and fruitful discussion are scarcely allowed – no, it is results that rule. Which makes me often sigh: "The process is the death of innovation." Genius simplicity will most likely perish in large systems. A single person or a startup sometimes can implement it and see it through to a final goal. But for large organizations, it's different – perhaps the only solution lies in a genius new boss who can step in from time to time to save things.